Panama City has always been a connector – between the old world and the new world, between east and west. Now with the new Biomuseum designed by Frank Gehry it is set to become a significant player as a key cultural city with a spectacular biodiversity research center. The new museum opened with some delay on October 2 and is situated between the Pacific Ocean to the east and the entrance to the Panama Canal to the west, placing it at the forefront of a new cultural and eco-tourist center for the region. It’s the latest interactive museum conceived by Gehry, whose projects in Bilbao, Spain and other cities have helped to revitalize cultural centers. 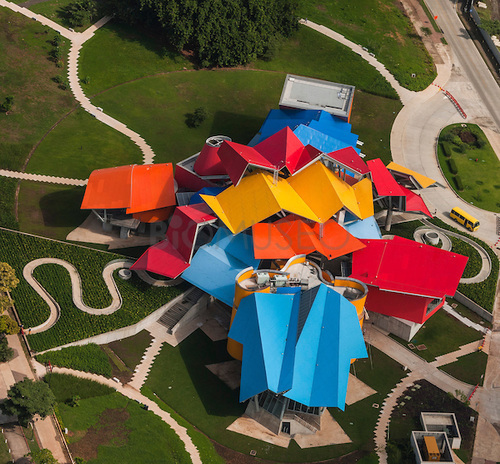 The vibrantly multi-colored structure is Frank Gehry’s first building in Latin America and will house a sequence of permanent exhibitions, conceived by the studio of his friend Bruce Mau. At the heart there is a public outdoor atrium covered by a lively assemblage of metal canopies in signature Gehry style. The canopies recall a local vernacular of tin roofs and provide protection from frequent tropical rains. From the atrium, views to the Canal and Panama City are a fantastic visual feast. In addition to content developed by the Smithsonian Tropical Research Institute, the museum will open up into a 6-acre (2.4-hectare) Biodiversity Park, designed in collaboration with the architect. As a destination and focus for the city, the building, exhibitions and park will provide a major new educational resource for the people of Panama and will no doubt attract visitors from around the world. The Biomuseo will certainly become the eco-tourism destination on many traveller’s list. Last year one of the most intriguing members of the Ace Hotel family – the American Trade Hotel and Hall opened in Panama City. Situated close to the historic old quarter in Casco Viejo in a restored landmark building, the hotel’s interior design reflects the history of Panama as a crossroads, and also features contemporary design and modern luxuries. The American Trade Hall next door to the hotel was originally built as a branch of the National City Bank of New York, financier of the Panama Canal. The design was modeled after the branch at 417 Broadway in New York, an esteemed example of the Moderne style by the architecture firm Walker & Gillette. The space has been restored and is being used for special events. The Hotel has also opened up a new cafe area – Cafe Undido, with an exhibition of commemorative posters. The shipping line posters reflect on the first passage of the S.S. Ancon through the American continent, paying respect to those who worked to realize the Panama Canal, one of the modern wonders of the world. There will also be a series of conversations exploring the history of Panama as the epicenter at the crossroads of the American continents, a joint venture between the hotel and the Biomuseo.